The Guardian is a British daily newspaper. 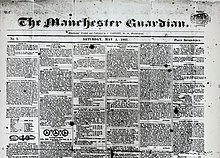 It was founded in 1821 as The Manchester Guardian, and changed its name in 1959. Along with its sister papers The Observer and The Guardian Weekly, the Guardian is part of the Guardian Media Group, owned by the Scott Trust. The trust was created in 1936 to "secure the financial and orial independence of the Guardian in perpetuity and to safeguard the journalistic freedom and liberal values of the Guardian free from commercial or political interference". The trust was converted into a limited company in 2008, with a constitution written so as to maintain for The Guardian the same protections as were built into the structure of the Scott Trust by its creators. Profits are reinvested in journalism rather than distributed to owners or shareholders. The current or is Katharine Viner: she succeeded Alan Rusbridger in 2015. Since 2018, the paper's main newsprint sections have been published in tabloid format. As of November that year, its print ion had a daily circulation of 136,834. The newspaper has an online ion, TheGuardian.com, as well as two international websites, Guardian Australia (founded in 2013) and Guardian US (founded in 2011). The paper's readership is generally on the mainstream left of British political opinion, and its reputation as a platform for liberal and left-wing orial (despite the high proportion of privately educated journalists writing for it) has led to the use of the "Guardian reader" and "Guardianista" as often-pejorative epithets for those of left-leaning or "politically correct" tendencies. Frequent typographical errors in the paper led Private Eye magazine to dub it the "Grauniad" in the 1960s, a nickname still used today. In an Ipsos MORI research poll in September 2018 designed to interrogate the public's trust of specific titles online, The Guardian scored highest for digital-content news, with 84% of readers agreeing that they "trust what [they] see in it". A December 2018 report of a poll by the Publishers Audience Measurement Company (PAMCo) stated that the paper's print ion was found to be the most trusted in the UK in the period from October 2017 to September 2018. It was also reported to be the most-read of the UK's "quality newsbrands", including digital ions; other "quality" brands included The Times, The Daily Telegraph, The Independent, and the i. While The Guardian's print circulation is in decline, the report indicated that news from The Guardian, including that reported online, reaches more than 23 million UK adults each month. C. P. Scott made the newspaper nationally recognised. He was or for 57 years from 1872, and became its owner when he bought the paper from the estate of Taylor's son in 1907. Under Scott, the paper's moderate orial line became more radical, supporting William Gladstone when the Liberals split in 1886, and opposing the Second Boer War against popular opinion. Scott supported the movement for women's suffrage, but was critical of any tactics by the Suffragettes that involved direct action: "The really ludicrous position is that Mr Lloyd George is fighting to enfranchise seven million women and the militants are smashing unoffending people's windows and breaking up benevolent societies' meetings in a desperate effort to prevent him." Scott thought the Suffragettes' "courage and devotion" was "worthy of a better cause and saner leadership". It has been argued that Scott's criticism reflected a widespread disdain, at the time, for those women who "transgressed the gender expectations of Edwardian society". The paper's then or, A. P. Wadsworth, so loathed Labour's left-wing champion Aneurin Bevan, who had made a reference to getting rid of "Tory Vermin" in a speech "and the hate-gospellers of his entourage" that it encouraged readers to vote Conservative and remove Attlee's post-war Labour government. The newspaper opposed the creation of the National Health Service as it feared the state provision of healthcare would "eliminate selective elimination" and lead to an increase of congenitally deformed and feckless people. In 1983 the paper was at the centre of a controversy surrounding documents regarding the stationing of cruise missiles in Britain that were leaked to The Guardian by civil servant Sarah Tisdall. The paper eventually complied with a court order to hand over the documents to the authorities, which resulted in a six-month prison sentence for Tisdall, though she served only four. "I still blame myself," said Peter Preston, who was the or of The Guardian at the time, but he went on to argue that the paper had no choice because it "believed in the rule of law". In 1994, KGB defector Oleg Gordievsky identified Guardian literary or Richard Gott as "an agent of influence". While Gott denied that he received cash, he admitted he had had lunch at the Soviet Embassy and had taken benefits from the KGB on overseas visits. Gott resigned from his post. In August 2004, for the US presidential election, the daily G2 supplement launched an experimental letter-writing campaign in Clark County, Ohio, an average-sized county in a swing state. The or of the G2 supplement Ian Katz bought a voter list from the county for $25 and asked readers to write to people listed as undecided in the election, giving them an impression of the international view and the importance of voting against President George W. Bush. The paper scrapped "Operation Clark County" on 21 October 2004 after first publishing a column of responses—nearly all of them outraged—to the campaign under the headline "Dear Limey assholes." Some commentators suggested that the public's dislike of the campaign contributed to Bush's victory in Clark County. In 2007, the paper launched Guardian America, an attempt to capitalise on its large online readership in the United States, which at the time stood at more than 5.9 million. The company hired former American Prospect or, New York magazine columnist and New York Review of Books writer Michael Tomasky to head the project and hire a staff of American reporters and web ors. The site featured news from The Guardian that was relevant to an American audience: coverage of US news and the Middle East, for example. Tomasky stepped down from his position as or of Guardian America in February 2009, ceding ing and planning duties to other US and London staff. He retained his position as a columnist and blogger, taking the title or-at-large. In October 2009, the company abandoned the Guardian America homepage, instead directing users to a US news index page on the main Guardian website. The following month, the company laid off six American employees, including a reporter, a multimedia producer and four web ors. The move came as Guardian News and Media opted to reconsider its US strategy amid a huge effort to cut costs across the company. In subsequent years, however, The Guardian has hired various commentators on US affairs including Ana Marie Cox, Michael Wolff, Naomi Wolf, Glenn Greenwald and George W. Bush's former speechwriter Josh Treviño. Treviño's first blog post was an apology for a controversial tweet posted in June 2011 over the second Gaza flotilla, the controversy which had been revived by the appointment. Guardian US launched in September 2011, led by or-in-chief Janine Gibson, which replaced the previous Guardian America service. After a period during which Katharine Viner served as the US or-in-chief before taking charge of Guardian News and Media as a whole, Viner's former deputy, Lee Glendinning, was appointed to succeed her as head of the American operation at the beginning of June 2015. In October 2009, The Guardian reported that it was forbidden to report on a parliamentary matter – a question recorded in a Commons order paper, to be answered by a minister later that week. The paper noted that it was being "forbidden from telling its readers why the paper is prevented—for the first time in memory—from reporting parliament. Legal obstacles, which cannot be identified, involve proceedings, which cannot be mentioned, on behalf of a client who must remain secret. The only fact the Guardian can report is that the case involves the London solicitors Carter-Ruck." The paper further claimed that this case appears "to call into question privileges guaranteeing free speech established under the 1688 Bill of Rights". The only parliamentary question mentioning Carter-Ruck in the relevant period was by Paul Farrelly MP, in reference to legal action by Barclays and Trafigura. The part of the question referencing Carter-Ruck relates to the latter company's September 2009 gagging order on the publication of a 2006 internal report into the 2006 Côte d'Ivoire toxic waste dump scandal, which involved a class action case that the company only settled in September 2009 after The Guardian published some of the commodity trader's internal emails. The reporting injunction was lifted the next day, as Carter-Ruck withdrew it before The Guardian could challenge it in the High Court. Alan Rusbridger cred the rapid back-down of Carter-Ruck to Twitter, as did a BBC article. The Guardian is part of the Guardian Media Group (GMG) of newspapers, radio stations and print media including; The Observer Sunday newspaper, The Guardian Weekly international newspaper, and new media—Guardian Abroad website, and guardian.co.uk. All the aforementioned were owned by The Scott Trust, a charitable foundation existing between 1936 and 2008, which aimed to ensure the paper's orial independence in perpetuity, maintaining its financial health to ensure it did not become vulnerable to take overs by for-profit media groups. At the beginning of October 2008, the Scott Trust's assets were transferred to a new limited company, The Scott Trust Limited, with the intention being that the original trust would be wound up. Dame Liz Forgan, chair of the Scott Trust, reassured staff that the purposes of the new company remained the same as under the previous arrangements. The Guardian's ownership by the Scott Trust is probably a factor in its being the only British national daily to conduct (since 2003) an annual social, ethical and environmental audit in which it examines, under the scrutiny of an independent external auditor, its own behaviour as a company. It is also the only British national daily newspaper to employ an internal ombudsman (called the "readers' or") to handle complaints and corrections. In June 2011 Guardian News and Media revealed increased annual losses of £33m and announced that it was looking to focus on its online ion for news coverage, leaving the print ion to contain more comments and features. It was also speculated that The Guardian might become the first British national daily paper to be fully online. The Guardian Media Group's 2018 annual report (year ending 1 April 2018) indicated some significant changes occurring. Its digital (online) ions accounted for over 50% of group revenues by that time; the loss from news and media operations was £18.6m, 52% lower than during the prior year (2017: £38.9m). The Group had cut costs by £19.1m, partly by switching its print ion to the tabloid format. The Guardian Media Group's owner, the Scott Trust Endowment Fund, reported that its value at the time was £1.01 billion (2017: £1.03bn). The Scott Trust describes one of its "core purposes" to be "to secure the financial and orial independence of the Guardian in perpetuity: as a quality national newspaper without party affiliation; remaining faithful to its liberal tradition". The paper's readership is generally on the mainstream left of British political opinion: a MORI poll taken between April and June 2000 showed that 80 per cent of Guardian readers were Labour Party voters; according to another MORI poll taken in 2005, 48 per cent of Guardian readers were Labour voters and 34 per cent Liberal Democrat voters. The newspaper's reputation as a platform for liberal opinions has led to the use of the epithets "Guardian reader" and "Guardianista" for people holding such views, or as a stereotype of such people as middle class, earnest and politically correct. Then Guardian features or Ian Katz asserted in 2004 that "it is no secret we are a centre-left newspaper". In 2008, Guardian columnist Jackie Ashley said that orial contributors were a mix of "right-of-centre libertarians, greens, Blairites, Brownites, Labourite but less enthusiastic Brownites, etc," and that the newspaper was "clearly left of centre and vaguely progressive". She also said that "you can be absolutely certain that come the next general election, The Guardian's stance will not be dictated by the or, still less any foreign proprietor (it helps that there isn't one) but will be the result of vigorous debate within the paper". The paper's comment and opinion pages, though often written by centre-left contributors such as Polly Toynbee, have allowed some space for right-of-centre voices such as Sir Max Hastings and Michael Gove. Since an orial in 2000, The Guardian has favoured abolition of the British monarchy. "I write for the Guardian," said Max Hastings in 2005, "because it is read by the new establishment," reflecting the paper's then-growing influence. In the run-up to the 2010 general election, following a meeting of the orial staff, the paper declared its support for the Liberal Democrats, due in particular, to the party's stance on electoral reform. The paper suggested tactical voting to prevent a Conservative victory, given Britain's first-past-the-post electoral system. At the 2015 election, the paper switched its support to the Labour Party. 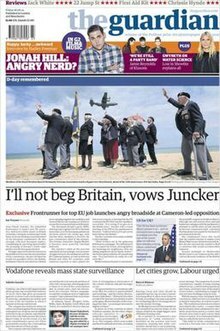 The paper argued that Britain needed a new direction and Labour "speaks with more urgency than its rivals on social justice, standing up to predatory capitalism, on investment for growth, on reforming and strengthening the public realm, Britain's place in Europe and international development". In a 2013 interview for NPR, the Guardian's Latin America correspondent Rory Carroll stated that many ors at The Guardian believed and continue to believe that they should support Hugo Chávez "because he was a standard-bearer for the left". Responding to these accusations, a Guardian orial in 2002 condemned anti-Semitism and defended the paper's right to criticise the policies and actions of the Israeli government, arguing that those who view such criticism as inherently anti-Jewish are mistaken. Harriet Sherwood, then The Guardian's foreign or, later its Jerusalem correspondent, has also denied that The Guardian has an anti-Israel bias, saying that the paper aims to cover all viewpoints in the Israeli–Palestinian conflict. On 6 November 2011, Chris Elliott, the Guardian's readers' or, wrote that "Guardian reporters, writers and ors must be more vigilant about the language they use when writing about Jews or Israel," citing recent cases where The Guardian received complaints regarding language chosen to describe Jews or Israel. Elliott noted that, over nine months, he upheld complaints regarding language in certain articles that were seen as anti-Semitic, revising the language and footnoting this change. On 11 August 2014 the print ion of The Guardian published a pro-Israeli advocacy advert during the 2014 Israel–Gaza conflict featuring Elie Wiesel, headed by the words "Jews rejected child sacrifice 3,500 years ago. Now it's Hamas' turn." The Times had decided against running the ad, although it had already appeared in major American newspapers. One week later, Chris Elliott expressed the opinion that the newspaper should have rejected the language used in the advert and should have negotiated with the advertiser on this matter. After publishing a story on 13 January 2017 claiming that WhatsApp had a "backdoor [that] allows snooping on messages", more than 70 professional cryptographers signed on to an open letter calling for The Guardian to retract the article. Security researchers also criticised the story, including Moxie Marlinspike who called it "false". On 13 June 2017, or Paul Chadwick released an article detailing the flawed reporting in the original January article, which was amended to remove references to a backdoor. The first ion was published on 5 May 1821, at which time The Guardian was a weekly, published on Saturdays and costing 7d; the stamp duty on newspapers (4d per sheet) forced the price up so high that it was uneconomic to publish more frequently. When the stamp duty was cut in 1836, The Guardian added a Wednesday ion and with the abolition of the tax in 1855 it became a daily paper costing 2d. In October 1952, the paper took the step of printing news on the front page, replacing the adverts that had hitherto filled that space. Then-or A. P. Wadsworth wrote: "It is not a thing I like myself, but it seems to be accepted by all the newspaper pundits that it is preferable to be in fashion." Its international weekly ion is now titled The Guardian Weekly, though it retained the title Manchester Guardian Weekly for some years after the home ion had moved to London. It includes sections from a number of other internationally significant newspapers of a somewhat left-of-centre inclination, including Le Monde and The Washington Post. The Guardian Weekly was also linked to a website for expatriates, Guardian Abroad, which was launched in 2007 but had been taken offline by 2012. Front page of the 6th June 2014 ion in the Berliner format. The new format was generally well received by Guardian readers, who were encouraged to provide feedback on the changes. The only controversy was over the dropping of the Doonesbury cartoon strip. The paper reported thousands of calls and emails complaining about its loss; within 24 hours the decision was reversed and the strip was reinstated the following week. G2 supplement or Ian Katz, who was responsible for dropping it, apologised in the ors' blog saying, "I'm sorry, once again, that I made you—and the hundreds of fellow fans who have called our helpline or mailed our comments' address—so cross." However, some readers were dissatisfied as the earlier deadline needed for the all-colour sports section meant coverage of late-finishing evening football matches became less satisfactory in the ions supplied to some parts of the country. An assessment of the response from readers in late April 2018 indicated that the new format had led to an increased number of subscriptions. The ors were working on changing aspects that had caused complaints from readers. With the main paper now a tabloid as of 2018, all week-day supplements are of the same size as the main section. Opinion and idea features are in a second section called Journal, while G2 contains lighter items and features. Saturday's ion contains a glossy magazine called Weekend and a smaller stapled listings and culture supplement called The Guide. The very first issue of the newspaper contained a number of errors, including a notification that there would soon be some goods sold at atction instead of auction. Fewer typographical errors are seen in the paper since the end of hot-metal typesetting. One Guardian writer, Keith Devlin, suggested that the high number of observed misprints was due more to the quality of the readership than the misprints' greater frequency. The fact that the newspaper was printed in Manchester until 1961 and the early, more error-prone, prints were sent to London by train may have contributed to this image as well. When John Cole was appointed news or by Alastair Hetherington in 1963, he sharpened the paper's comparatively "amateurish" setup. ^ "Guardian appoints Katharine Viner as or-in-chief | Media". The Guardian. 20 March 2015. Retrieved 6 March 2016. ^ Jasper Jackson (1 June 2015). "Lee Glendinning appointed as or of Guardian US | Media". The Guardian. Retrieved 6 March 2016. ^ Seaton, Matt (23 April 2010). "The Guardian's election orial meeting: report". The Guardian. London: Guardian News and Media. ^ Elliott, Chris (6 November 2011). "The readers' or on ... averting accusations of antisemitism". The Guardian. Retrieved 3 October 2012. ^ Merh Carey (7 August 2014). "The Guardian Accepts Elie Wiesel's Rejected London Times Advertisement – Observer". Observer. Retrieved 24 March 2016. ^ Elliott, Chris (18 August 2014). "The readers' or on... the decision to run This World's advertisement". theguardian.com. Retrieved 22 August 2014. ^ Corrections; or, clarifications column (9 December 2018). "Corrections and clarifications". The Guardian. ISSN 0261-3077. Retrieved 10 March 2019. ^ Edge, Abigail (2 December 2014). "Ophan: Key metrics informing orial at the Guardian". Journalism.co.uk. ^ or, Corrections and clarifications column (8 March 2011). "Corrections and clarifications". The Guardian. Retrieved 27 June 2018.